My long awaited Raspberry Pi has arrived about 2 weeks ago. I’ve ordered some accessories along with it, like an SD card, a HDMI cable and a power supply. What was missing though, was any kind of input device. 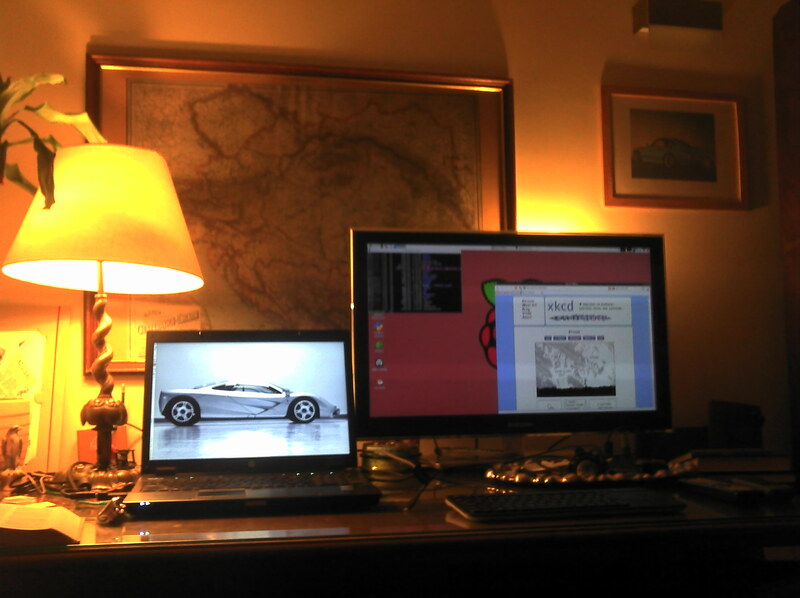 I flashed the Raspbian image to the SD, hooked it to the TV and go. It booted! And then waited hopelessly for me to log in. 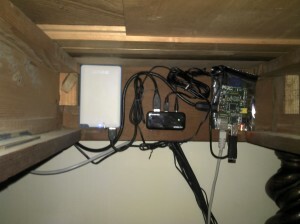 Fortunately my flat has built-in Ethernet everywhere, so I connected the Pi, and tried to ssh into it from an Ubuntu laptop. Success! I typed “startx” and an orphaned LXDE session popped up on the TV. Rather useless without a mouse. Ladies and gentlemen: 2 full desktop environments running on 1 screen! And that was it for the first weekend with the Pi. For the second weekend, I bought some more accessories: Logitech K400 wireless keyboard with built-in touchpad, 1 TB USB hard-disk and a powered USB-hub. Time to build my low-power home server. Built into the hidden recesses of my desk. Then I turned my USB printer into a network-printer installing CUPS on the Raspberry. The last adventure so far was setting up an FTP-server on said fruit. Vsftpd. VS probably means very secure, which usually stands for totally unusable. And yes, it was a bloody nightmare to set up. At the end it turned out you have to comment out nearly all lines in the bloody /etc/pam.d/vsftpd file. Oh well.